Long time no see my dear friends, but you were always in my thoughts. There comes a time in your life when you need to step back and set up your priorities, so I took the liberty to take a break from blogging and think things through. I wasn't completely away from the beauty world, because I was reading my favorite blogs, buying and testing new products and I constantly informed myself about beauty and lifestyle related news, as I was planning to come back on the blog. As you may know, on January 23rd my blog had its 3 years anniversary and I decided to ”dress” it up a little with new clothes - so you may have noticed my new banner, a completely new design and layout. I really hope you like it, as I was striving for a clean, professional look, but yet friendly and cute, easy to read. I want to thank you all from the bottom of my heart for your continuous support and patience! I AM BACK!!! 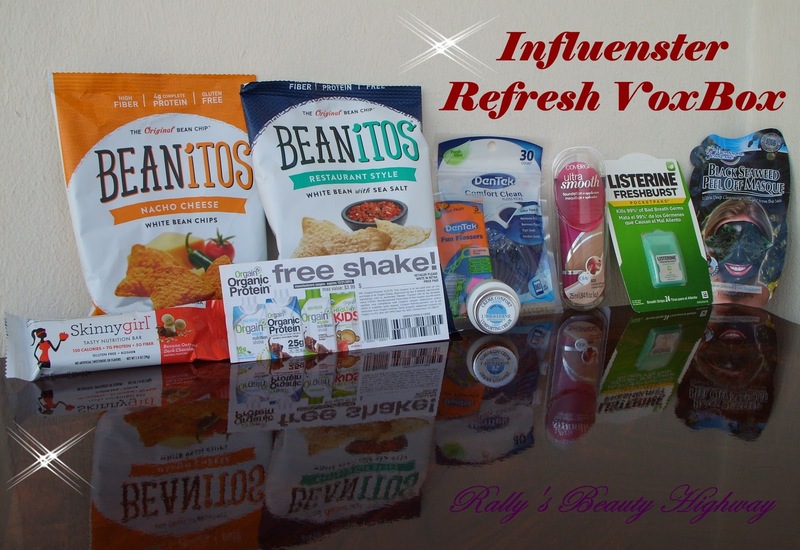 In today's post you will discover the Refresh VoxBox from Influenster - an exclusive online community where tastemakers and trendsetters come to share the latest and greatest news, places, products, and reviews with each other. This was the first box received in 2015 and it was full of goodies. As you can see in the pictures down below there was a pretty good selection of products, from cosmetics, to food/ snacks and oral hygiene. Let's see together what I have received in my Refresh VoxBox! 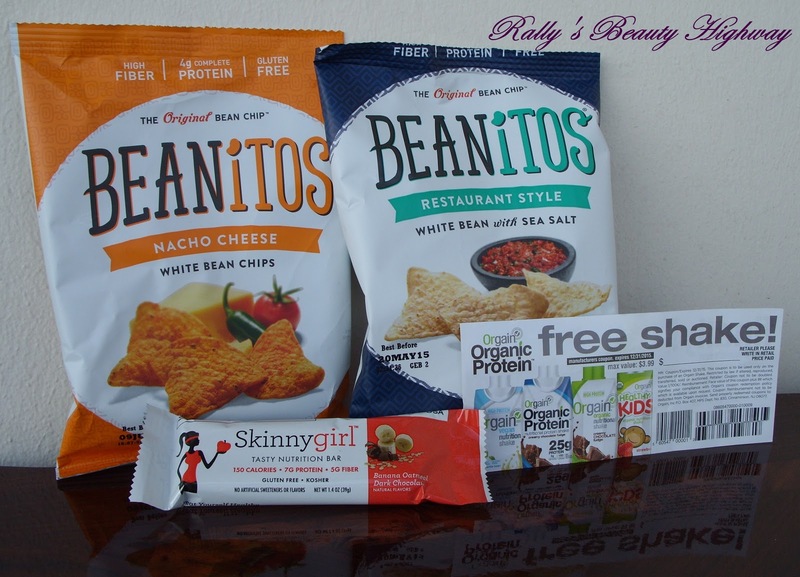 The Beanitos Chips - claim to be ”America's newest superfood”, full of fibers and proteins, free of preservatives, gluten-free and non-GMO. Let me say that the ”Nacho Cheese” flavor quickly became my favorite snack, it was so savory and crunchy and I devoured it in no time. Beanitos Chips cost $3.49/ bag. The Skinnygirl Tasty Nutrition Bar - is the perfect snack for your purse and afternoon cravings. I've got the Banana Oatmeal Dark Chocolate flavor and it was absolutely delicious. Can't think about a better combination than that! With 150 calories, 7g of proteins and 5g of fiber, it kept me going through the day. One bar is $1.49. The Orgain Certified Organic Nutritional Shake - this product has an interesting concept, it was formulated to provide ”nourishment on-the-go” for active people. I received a $3.99 coupon for a free shake and I set my eyes on the Creamy Chocolate Fudge flavoring, but unfortunately I could not find it anywhere and I tried at a few local Wal-Marts, Targets and Walgreens. If you see them, please let me know! An Orgain Nutritional Shake is usually between $3-$4 each. The COVERGIRL UltraSmooth Foundation - I was very excited to discover this new foundation among this VoxBox's goodies. I have received the shade 820 Creamy Natural and I had the chance to play a little bit with this product. To give you an idea - the foundation comes with an unique applicator which I am not a big fan of, it's blendable and has a good coverage without looking cakey. A more in depth review about the COVERGIRL UltraSmooth Foundation will appear soon on the blog. This new foundation costs between $12.99-$16.99. The L'Occitane Shea Butter Light Comforting Cream - I am so happy that L'Occitane came up with a light version of their well known and loved cream.This product is perfect for my sensitive combination skin - its light, non-greasy formula (which contains 5% shea butter) absorbs quickly into my skin, leaving it hydrated and comfortable all day long. If this face cream would have had a SPF at least 30 it would have been a dream come true for me. Depending on its weight the L'Occitane Shea Butter Light Comforting Cream costs $5 for 8ml or $28 for 50ml. The Montagne Jeunesse Face Masque - now I know this brand quite well and I can say that I love their masques. Every time when I feel the need of a small pampering session I put a Montagne Jeunesse masque on. 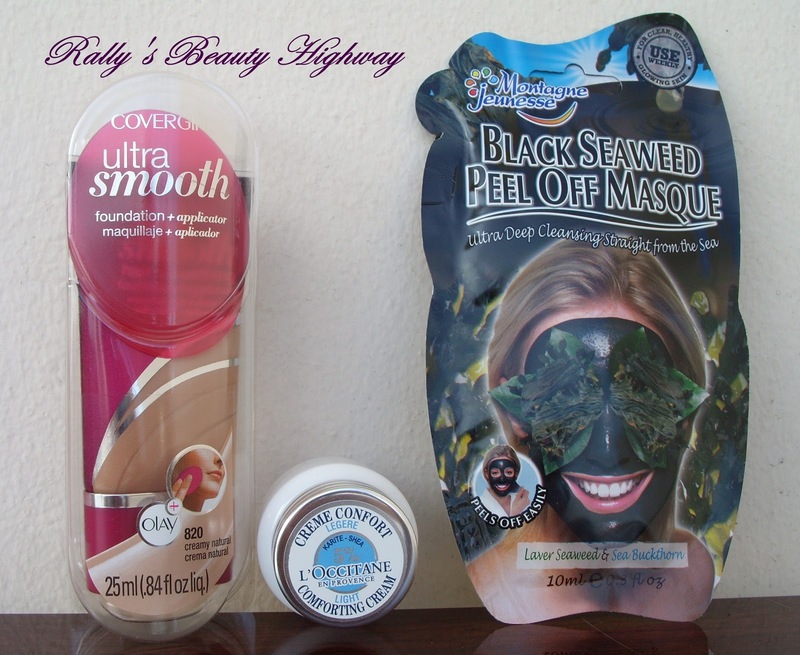 I tried the Black Seaweed Peel Off masque, and If I may looked like a sea monster, my face sure does love it, because I felt my skin clean and hydrated. Only $1.49 for this product, a real bargain. 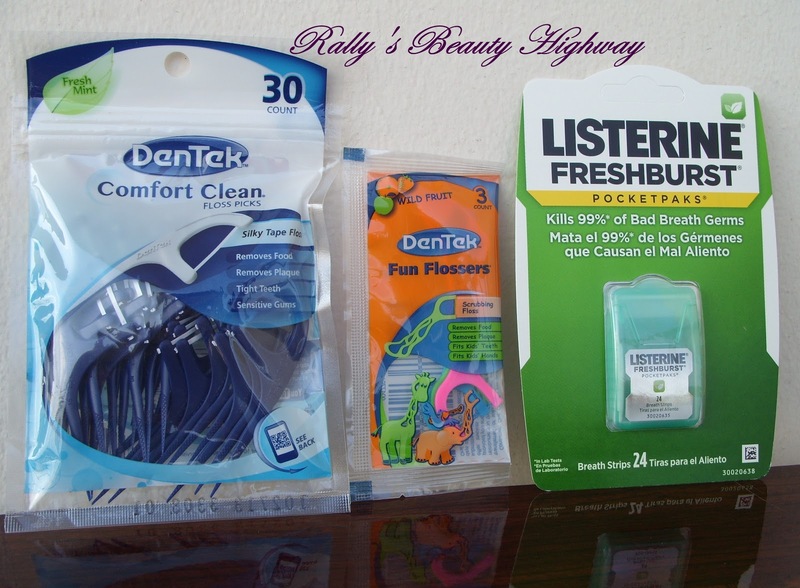 The DenTek Comfort Clean Floss Picks (for adults) - I am a flossing freak, so those were just coming in handy. They are gentle, yet effective and I am very happy to have tried them. They cost $1.39. The DenTek Fun Flossers (for kids) - my inner child really enjoyed the wild fruit flavoring while using these little samples. Depending on how many you get in a pack they cost between $2.19 and $3.39. The Listerine Pocketpaks - have the perfect size to carry in your bag when you need to refresh your breath on-the-go. They cost $1.40. These were the goodies from my Refresh VoxBox. I was very happy to have been selected to test them, I really enjoyed doing it. I hope you loved reading this post as well. If you wanna know more about any of these presented products, please let me know in the comments section down below. Disclaimer: I received all these products complimentary from Influenster for testing and review purposes, that did not affect my truthful and honest opinion.